Operation Focus (or "Moked" (Hebrew: מוקד . Pronounced "Mo Kehd" - meaning "Focus.") was the Israel Air Force operation that opened the Six day war, destroying most of the Egyptian air force on the ground in the space of a few hours. Operation Focus (Moked) is of great importance in the study of air strategy and set a very high standard for subsequent air war operations in Israel. Israel decided to pre-empt Egypt by attacking on the morning of June 5, 1967. The plan for Operation Focus had been evolving since about 1963, evidently based on an idea by former IAF commander Dan Tolkovski. It was elaborated and implemented by Israel Air Force Commander Moti Hod and Chief of Staff Yitzhak Rabin. Operation Focus ("Moked") was modeled on surprise air attacks of World War II, such as the Japanese attack on Pearl Harbor and the Luftwaffe attack on USSR air bases. The Germans had planned a similar air attack on Polish air bases, but were prevented from carrying it out by bad weather. In order to make the plan possible, Israel would have to use every single available aircraft, and to make the most of them by reducing the turnaround time (the time taken to rearm and refuel the aircraft) to 8 minutes rather than the usual hours (Egyptian Air force required 8 hours to fuel and load an aircraft). Numerous practice runs over mockup fields perfected the plan. A specially designed 180 pound bomb, the French-Israel designed Durendal, was used to penetrate the runways and do maximum damage. The bomb was driven into the ground by a rocket and then exploded, often with a delay, leaving a crater 5 meters wide by 1.6 meters deep. To fool the Egyptian radar, trained on Sinai, the attacking sorties would fly in from the sea. Aircraft that failed were not allowed to break radio silence and would have to bail out over the sea. 45 Fouga Magister (IAI Zukit) Trainer July 1960 378 1,250 13,500 ?? The 45 Fouga Magister (Zukit) training craft were used as decoys in operation Focus, though they were also used in actual missions both in the Six Day War and in the Yom Kippur War, and were shot down in action. The approximate Egyptian battle array is given here: Six day war along with comparisons of some of the principal aircraft. The plan of operation Focus proceeded in three waves. In the first wave, the planes were scheduled for precise staggered departure times (from 7:10 to 7:46 AM) and arrival over Egypt at about 8:15 when Egyptian pilots were eating breakfast. 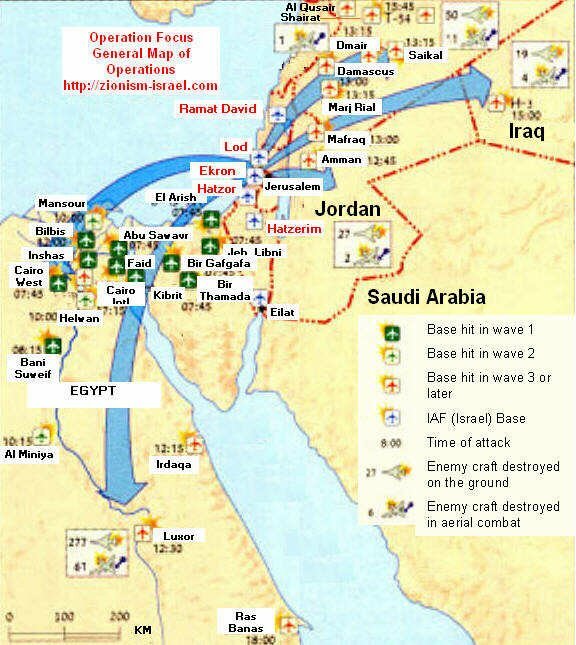 Most of the planes flew out over the Mediterranean and then headed into Egyptian territory, but others flew low along the Red Sea to hit bases in the Egyptian interior. The Israelis targeted 11 fields in Egypt, with the farthest ones presumably reserved for the faster aircraft. The Israelis had some luck. The attacking craft flew under the radar and were not detected by the Egyptians. The Jordanian radar at Ajlun noticed and correctly identified the attack, issuing the code word "inab" (grape) for the attack. This was relayed to the Egyptians, but evidently the Egyptians were using a different radio wavelength and never got the message. Field Marshall Hakim Amer and the Egyptian general staff were in the air in an IL-14 transport. He had forbidden the use of anti-aircraft fire to ensure that his plane would not be hit by accident. 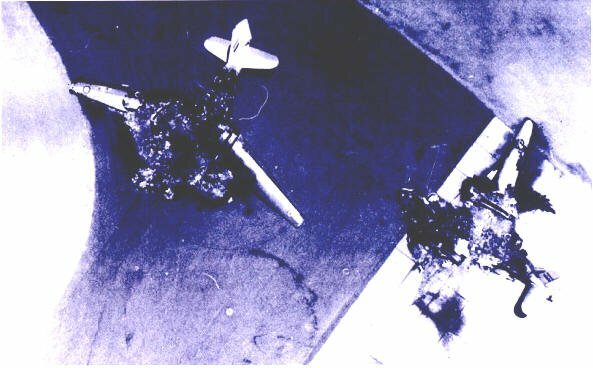 The plane landed during the attack, and was noticed by Israeli pilot Avihu Bin Nun, who ignored the transport and targeted more tempting MiG-21s. 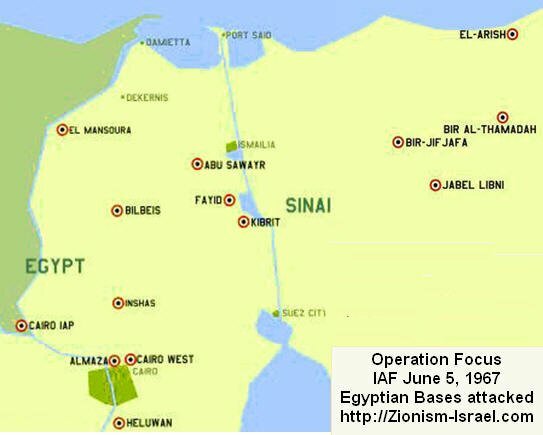 During the first wave of Operation Focus, 11 airfields in Sinai and Egypt proper were attacked. The Israelis destroyed about 197- 204 aircraft (according to different accounts), as well as all Egyptian missile defenses and the communication link between Sinai and Egyptian supreme headquarters. 183 - 186 aircraft participated in the first wave. Nine of the Egyptian planes were taken down in dog fights. 10 Israeli aircraft were destroyed in the first wave. An additional 107 Egyptian planes were destroyed in the second wave, which hit 16 Egyptian airfields. It began at 9:34 and was finished by 10:34 (meaning pilots were returning home). By this time, most of the element of surprise was gone, though in Cairo, crowds were celebrating fictitious victories and were totally unaware of the disaster, as was much of the Egyptian government. About 164 sorties were flown in this wave. In total, over 310 aircraft were destroyed in the first two waves, in about 3 hours. Of the destroyed aircraft, 286 were combat aircraft, of which the fighters and bombers are given in the table below. Over 30 other combat aircraft of various types (helicopters, transport) were destroyed as well. The third wave of Operation Focus was directed at Syria Jordan and Iraq, which had launched attacks against Israel around noon. Unlike the first two attacks, not all the targets were predetermined apparently, and it was disrupted a bit by changes in targeting. It began at 12:45 PM. About 100 planes participated. 51 sorties were flown against targets in Jordan, destroying the entire Jordanian air force. About 82 sorties were flown against Syria, destroying about half the Syrian aircraft (50-60 according to different reports). The remainder were moved to remote bases. On the evening of the first day, IAF attacked the Ras Banas air base in southern Egypt. In the entire war, Israel lost about 10% of its aircraft and destroyed about 70% of the enemy aircraft, most of them in the first 6 hours of Operation Focus. Israeli Vautour aircraft attacked H-3 and other bases in Iraq and supposedly destroyed 10 aircraft, though this is disputed. Israel attacked Iraqi bases again on the second and third days. Some additional Egyptian and Syrian aircraft were destroyed on subsequent days. * According to ACIG Al Latakia (not shown) in Northern Syria was also attacked on June 5. By 10:30 AM, after only two waves of attacks, Moti Hod told Yitzhak Rabin, then Chief of Staff, "The Egyptian air force has ceased to exist." Some 30 seconds from the end of the [first] attack, a second wave of planes arrived... We ran about the desert, looking for cover, but the planes didn't shoot. They merely circled, their pilots surprised that the base was completely destroyed and that no targets remained. We were the only targets... weak humans scurrying in the desert with handguns as out only means of defense. It was a sad comedy... pilots of the newest and best equipped jets fighting with handguns. Five minutes after the beginning of the attack the [Israeli] planes disappeared and a silence prevailed that encompassed the desert and the noise of the fire that destroyed our planes and the airbase and the squadron. They completed their assignment in the best way possible, with a ration of losses- 100 percent for us, 0 percent for them. (Oren p 176). The results of the first attacks were double the Israeli expectations most likely because of the surprise, because Amer had ordered no anti-aircraft fire, and because all planes were really initially on the ground. The Egyptian government concocted a story that the Americans had aided in carrying out the attacks. This story angered the United States, which had been careful to stay out of the war. Israel understood that it had essentially won the war by about noon of the first day of the Six day war. While Israel did win the war, the victories were due in part to lack of coordination and deployment of Egyptian and Syrian ground troops as well as their lack of air power. The quick victory of Operation Focus caused Israel to exaggerate the importance of air power at the expense of artillery. Operation Focus also caused a fixation on the idea of destroying air bases. By the time of the Yom Kippur War, the Arab states had learned the lessons of operation focus. Air defense was provided by Soviet anti-aircraft missiles, and planes were kept in protected hangars. Attacks on air fields were largely irrelevant. Copyright © 2008 - Do not copy this or any other article to your Web site or use it for any purpose without the written permission of the author. Oren, Michael, Six Days of War, Oxford University Press, 2002, pp 171-178. 'H - ('het) a sound made deep in the throat. To Western ears it may sound like the "ch" in loch. In Arabic there are several letters that have similar sounds. Examples: 'hanukah, 'hamas, 'haredi. Formerly, this sound was often represented by ch, especially in German transliterations of Hebrew. Thus, 'hanukah is often rendered as Chanuka for example.